There’s no doubt about the influence of digital innovation on private and social life. Digital is another way for humans to interact. And, by the way, there is no doubt about how digital innovation impacts on reputation and sometimes on social acceptance and social inclusion. Thus, digitization is not only about technology, but it’s a social phenomenon itself. It has changed our lives and its impact has been changing every day and creating unimaginable changes in the years to come. Data, facts, news, discoveries, conversations, opinions, ideas, ventures, trends and a lot of other stuff are shared every minute by almost everyone. 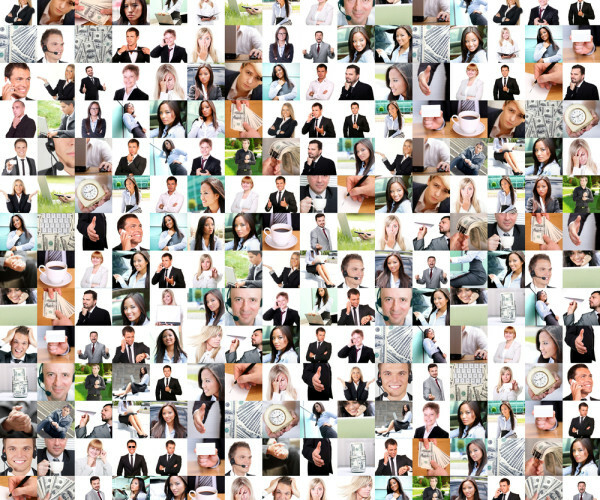 Digital has led to a broader and quicker fruition of any kind of content by everyone. Digital makes everyone experience everything directly. Sharing experience is the golden rule. And shared experiences are intensified even if they happen in silence, or with someone who an individual has only just virtually met. Mobile is the king, social networks are the queen. 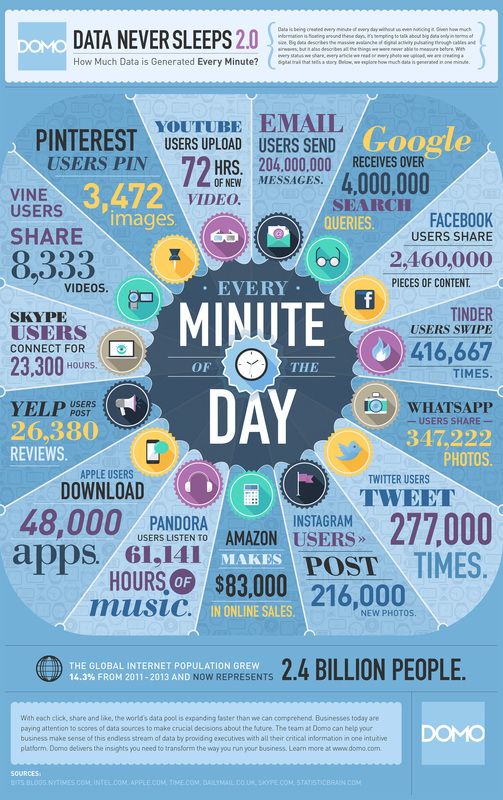 The amount of digital data generated every minute is staggering. The pace of data creation keeps accelerating every year. Market leader Facebook was the first social network to surpass 1 billion registered accounts and currently sits at 1.55 billion monthly active users. Eighth-ranked photo-sharing app Instagram had over 400 million monthly active accounts. That’s up from 1.55 billion users and $4.5 billion in revenue last quarter. Even with Q4 being the holidays, that 29.8% QoQ revenue growth is stunning, and it’s up 51% vs Q4 last year. 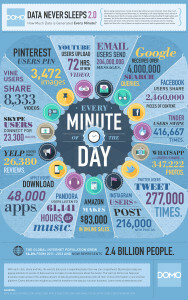 The amount of data is being created every minute as a by-product of everyday online presence in websites and social media. That disruptive change in our social and private life, changed everything, from people to content. People matters. Content does, too. In such context, the measure of everyone’s value is their social influence. The risk of the an over-sharing epidemic is real. Those who don’t share anything or have no followers, simply don’t deserve to be followed. They technically don’t exist. There are no boundaries and no rules that dictate what can or can’t be shared. And the absence of any perception of risks doesn’t stop anybody from doing that. It’s content that people watch again and again and again. 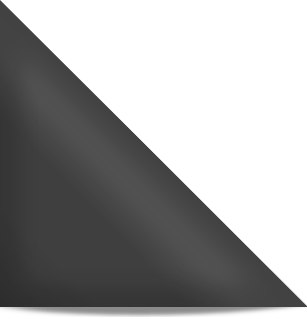 For online video, that’s a great measure of how successful it is. Moreover the illusion of anonimity in the web apparently seems to permit borderline behaviours that would be banned in real life. The complete unawareness of the potential virality of every content which will be shared in the web joins no perception of the risk and danger of sharing everything. Thus it is crucial to bethink responsibly about digital and mobile developments and their impacts on relationships and communications overall. More so because digital innovation is changing human behaviours forever and altering the ways human relationship is being lived, along with the impact on the future of next generations. Long ago, relationships were limited to friends or known people. Now, every person has an average of 200 or 300 “friends”. More precisely, as reported in 2014, half of all Facebook users have more than 200 friends. But of those friends, only a small percentage is made of real friends or people met really in life. The others are simply people of the web requesting a contact. Nevertheless, the data shared with them is the same. Youngsters seldom use a filter to manage a different distribution. And sometimes that indistinct distribution hides risks and dangers because almost every personal data, every photo, comments, all is shared. So, private has become public: private is neither protected, nor filtered. Everyone openly shares, discusses, views and comments their own lives. Digital makes private public but public also means social. Thus, digital makes private social. Then, what has changed too are not only the kind of data shared and the people to whom they are sent but also the language people uses and its velocity. Time is totally consumed over that new forms of communication. Velocity means immediate propagation, resonance, reach and sometimes virality. Not everything becomes viral but everything can go viral. The greater the network, the broader the resonance, the more pervasive the virality. But nobody reflects enough on such dynamics. There are very few youngsters who are aware of the related risks. Their safety and security cannot be a bet but must be a certainty. That means that if something goes wrong, the followers’ likes and consensus may become silence in the best cases and the sense of exaltation become rapidly something different.